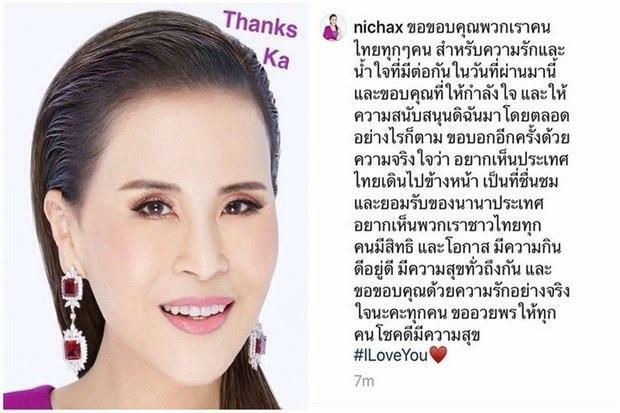 Thai Princess Ubolratana conveyed a message of thanks to Thais on Saturday morning after King Vajiralongkorn issued a royal announcement late on Friday night saying political involvement by a senior royal is inappropriate. Princess Ubolratana conveyed a message of thanks to Thais Saturday morning after His Majesty the King issued a royal announcement late on Friday night saying political involvement by a senior royal family member was inappropriate. 2019-03-24 Voters in Thailand head to the polls to elect all 500 members of the House of Representatives. This is the first parliamentary election held in the country since the invalidation of the 2014 Thai general election and the ensuing 2014 Thai coup d'état. 2019-01-1 A Thai man kills six members of his family before killing himself in a drunken shooting spree. 2017-04-6 Thai King Vajiralongkorn signed into law a new Constitution of Thailand that paves the way for democratic reforms while allowing the Royal Thai Army to retain its influential role in Thai politics. 2016-11-1 Thailand is preparing for the December 1, 2016, ascension of Crown Prince Maha Vajiralongkorn to the throne, according to senior military sources. 2016-10-13 The King of Thailand Bhumibol Adulyadej dies at the age of 88. He was the world's longest currently serving monarch.